A gorgeous music jewellery box makes the perfect gift for a young girl celebrating a special event, such as a Christening or baptism. It also makes a beautiful gift for a new born. She can treasure it for years to come. 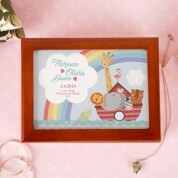 It features a colourful illustration of Noah's Ark, complete with animals and a wavy sea. 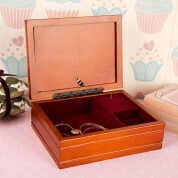 The box plays a pretty melody when opened and is lined with luxury red velvet. 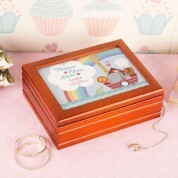 It comes complete with personalisation – her full name, a special memorable date and a short “With love” message. The design is sublimated on to white metal, giving a vibrant and lasting print.